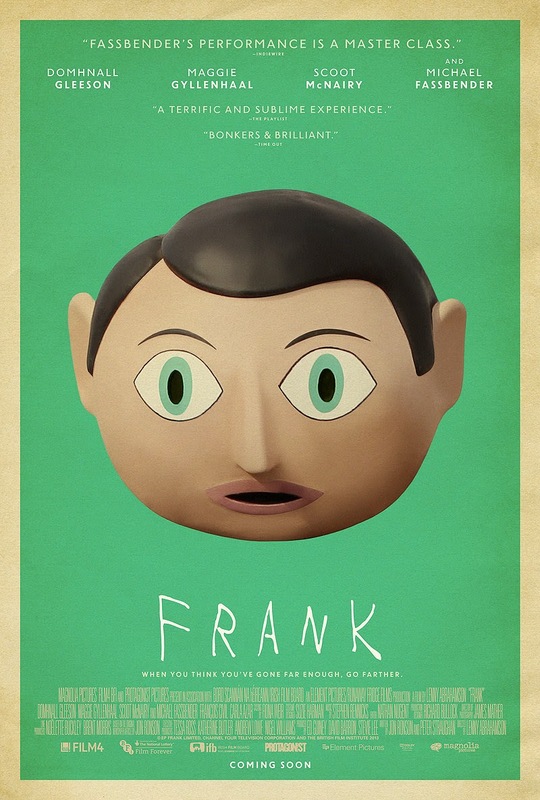 Frank is an underrated, under seen film from the U.K., and one of the pleasant surprises of 2014. 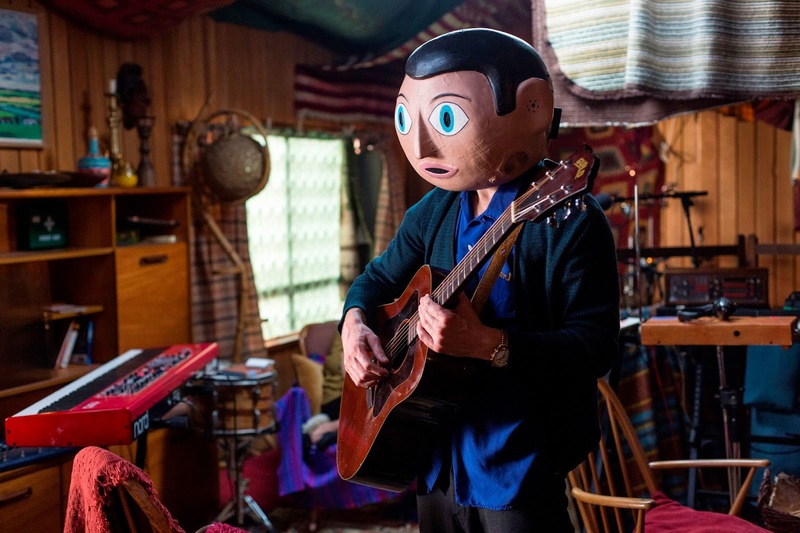 Frank (Michael Fassbender) is the lead singer of the experimental indie band Soronprfbs (yes it's really just a random combination of letters that form something unpronouncable). He wears a funny looking, giant mascot head at all times (humorously even while showering). He's thought of as musical genius. He draws people in and has this mystical power to inspire those around him. We experience him and his ways with his band through the eyes of Jon (Domhnall Gleeson), a young aspiring musician with lacking confidence. The opening of the film is Jon standing outside observing the random happenings around him and attempting to capture the scene in song. It's clear that, while he wants to be a singer/songwriter, he really hasn't figured it out yet. He hasn't found inspiration yet, but much like many young adults he's addicted to sharing his life, however boring it may be, on Twitter and YouTube, essentially to an audience of none. Eventually he happens upon a crazed man attempting to drown himself in the ocean. Turns out he's the keyboardist for the band Soronprfbs, and they have a gig later that night. Offering his talents to them as a filler, Don (Scoot McNairy), the band's manager takes him in. With no prior knowledge of the band or the music he's thrown out on stage and has to try to join in on the music as it's happening. It's his first experience with Frank and his improvisational lyrics. It's also his first experience with this extremely dysfunctional family. With no other choice the band takes Jon along with them as their keyboardist as they go to their distant cabin in the woods (no not the horror movie), where they intend to create new songs for a new album. The problem is that Frank is such a perfectionist that he refuses to record a single note until they've perfected the entire album. As you might expect this takes months, and consumes all of their funds, including Jon's inheritance. As they work together, Jon draws inspiration from Frank and hate from the rest of the band members, particularly Clara (Maggie Gyllenhaal), Frank's girlfriend and the band's theremin player. All along the way Jon continues to upload videos to YouTube and share updates on Twitter to an ever increasing audience. Their growing fame prompts a trip to the US to perform at South By Southwest. The other band members don't want fame and fortune, but Jon is able to convince Frank to go. They enjoy their obscurity, and know, for reasons learned later, why it's better to stay that way. However, Jon keeps driving them and encouraging Frank to share his music with a wider audience. The film spends its time questioning true creativity, how it's inspired, the types of people who are creative and ultimately what to do with your creativity. Is it fulfilling to keep your creativity to yourself? Do we need to hide behind masks for acceptance? Frank surprises by being more than just a fun indie comedy. It is a genuinely funny film, but there is also a deeper layer to it that makes it something more. It's the type of film that will inevitably be a cult classic in years to come. I wouldn't even be surprised to see imitators trying to form experimental/improvisational bands much like the one found in this film. Despite being masked for most of the film, Michael Fassbender gives an affecting performance. 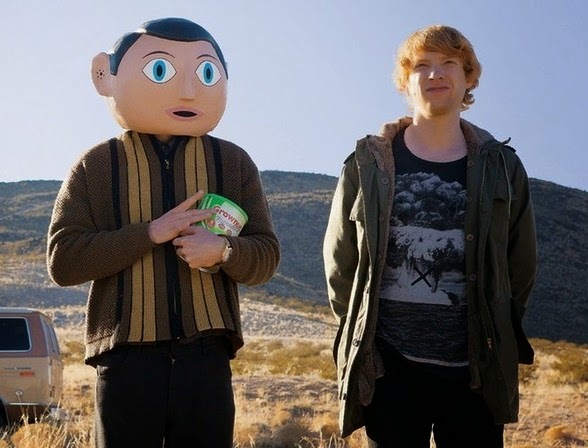 It may or may not come up in award discussions, but either way Frank should not be missed.